1. Warm the oil in a large frying pan or shallow casserole dish or roasting tray over a high heat. Season the chicken then fry it with the bacon for 5-6 minutes, turning occasionally, until golden. Add the thyme, garlic, half of the butter and 150ml cold water to the pan. 2. Reduce the heat to low, partially cover with a lid (or foil) and leave to simmer for 35-40 minutes, turning the chicken halfway through, until tender, the juices run clear and there is no pink meat. Use tongs to remove the chicken from the pan, cover with foil and set aside to rest. 3. Increase the heat to medium. Add the remaining butter and the onions to the pan and simmer for 8-10 minutes, stirring occasionally, until tender. Add the peas and 150ml cold water then season. Bring to a simmer for 4-5 minutes until the peas are just tender. 4. Add the lettuce and stir until just wilted. Remove the thyme stalks. 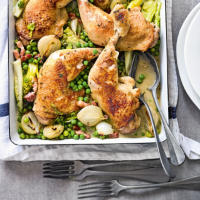 Return the chicken to the pan, then take to the table and serve with new potatoes or crusty bread.